Thanksgiving Day is the fourth Thursday in November. Many Americans enjoy a local Thanksgiving parade, or the annual Macy’s department store parade, televised live from New York City. Others watch televised American football, while all give thanks together for their food, shelter and other good things. The holiday dates back to 1621, the year after the Puritans arrived in Plymouth, Massachusetts, determined to practice their dissenting religion without interference. After a rough winter, in which about half of them died, they turned for help to neighboring Indians, who taught them how to plant corn and other crops. Two Wampanoag men, Samoset and Squanto (or Tisquantum), taught the Pilgrims how to cultivate the new land. The next fall's bountiful harvest inspired the Pilgrims to give thanks by holding a feast. At harvest time, the Pilgrims invited the men, along with Massasoit, the local Wampanoag leader, and all three men's families to share the harvest celebration with them. Those three families turned out to include more than 90 people, and because the Pilgrims were not prepared to feed so many, the Wampanoag themselves provided most of the food for the festival. Thanksgiving festivals continued throughout colonial and early American times, but for much of that period, the holiday wasn't celebrated every year. In 1777, the Continental Congress declared the first national American Thanksgiving following the providential victory at Saratoga. 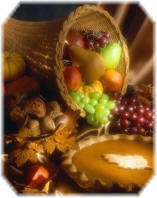 National Thanksgivings were proclaimed annually by Congress from 1777 to 1783. After a five year hiatus, the practice was revived by President Washington in 1789, the year of his inauguration. He issued another proclamation in 1795. In 1827, Boston Ladies' Magazine editor Sarah Josepha Hale began a campaign to have Thanksgiving Day permanently proclaimed as a national holiday. On October 3, 1863, in the middle of the Civil War, President Abraham Lincoln appointed a national day of Thanksgiving to be observed on the last Thursday in November. Every president after Lincoln issued an annual proclamation to set the date of Thanksgiving. This continued until 1941 when a joint congressional resolution officially set the date as the fourth Thursday in November. Today the holiday traditionally revolves around sharing a hearty meal featuring such favorites as turkey, stuffing, sweet potatoes, cranberry sauce, and pumpkin pie. Before the meal begins, families or friends usually pause to give thanks for their blessings, including the joy of being united for the occasion.